Thank you for supporting fish and wildlife conservation in Alaska! TED Program biologist Travis Booms releases a golden eagle after attaching a GPS transmitter to determine breeding season and migratory movements. 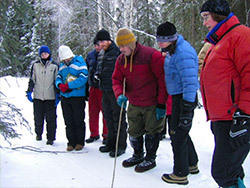 Wildlife Education specialist Mike Taras checking out animal tracks with teachers at a workshop in Fairbanks. Alaska's remarkable fish and wildlife are one of its most valuable assets. 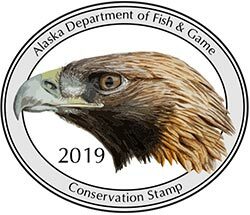 Through your purchase of an Alaska Department of Fish and Game conservation stamp, you will be helping conserve the diverse array of fish and wildlife species that call Alaska home. Alaska's citizens and visitors alike benefit from the sound management of our fish and wildlife resources through rewarding experiences such as wildlife viewing, nature tourism, hunting, and fishing. Subject to appropriation, funds from the stamp will be used to meet conservation needs for fish, wildlife, and associated habitats and will support research and monitoring of species that are not hunted or fished, as well as conservation education. Under Alaska's State Wildlife Action Plan, department biologists work proactively with our partners to conserve fish and wildlife species before they become threatened or endangered, to recover species already imperiled, and to keep "common species common." ADF&G carries out projects to conserve the broad array of species and their habitats in Alaska — from bats and small birds to polar bears and beluga whales to fish and aquatic invertebrates. ADF&G also provides conservation education programs across the state. By educating Alaskans and others about our state's fish and wildlife resources and the work conducted by ADF&G, our education programs support and encourage an engaged citizenry capable of making informed decisions related to the sustainable management of fish and wildlife species. From outdoor skills classes to teacher workshops and citizen-science projects, ADF&G offers an array of outdoor learning experiences and educational resources to the public. About the Artist: Bryce W. Robinson is an ornithologist and illustrator. He has conducted work across much of Alaska on many species, including Golden Eagle focused research with Alaska Department of Fish & Game. He currently lives in Boise, Idaho, where he manages Ornithologi: A Studio for Bird Study. Few wild animals capture our attention, respect, and fascination more than golden eagles. They symbolize Alaska's wild places, rugged people, and awe-inspiring wildlife encounters. Their intense, silent stare stirs the emotions of anyone lucky enough to have a close encounter. Hence, ADF&G considers them the perfect species to feature on our 2019 conservation stamp. Golden eagles are among the largest raptors in North America, with a 7-ft wing span. They use their powerful wings and long, razor sharp talons to catch prey such as ground squirrels, hares, ptarmigan, and even young caribou and sheep. They nest on cliffs across Alaska, from Southeast rainforests to the North Slope. ADF&G has been a leading force in better understanding this little studied species in Alaska. 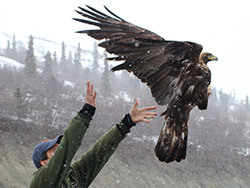 Biologists with the department, collaborating with federal partners, have conducted long-term monitoring of golden eagle populations, using satellite telemetry to follow their migrations, and conducting annual spring counts of returning eagles to gain insights into the size and status of Alaska's population of this magnificent bird. What we have learned has been extremely useful to managing this iconic species. We are providing the first density estimates for a large portion of the state, which is leading to the first scientifically based statewide population estimate. Preliminary results suggest that Alaska may support one of the largest populations in the US. We have learned where golden eagles that nest in Alaska spend their winters, and have identified important migration corridors and wintering areas. This can improve management of resource development, such as wind farms, minimizing impacts on eagles. Your purchase of this year's conservation stamp is greatly appreciated. The $20 stamp is a water-resistant 3.5" by 3" oval sticker. To purchase a stamp, visit ADF&G's store.